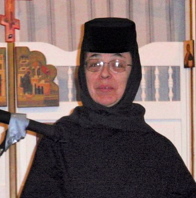 Mother Magdalena from the Monastery of the Transfiguration in Ellwood City, PA, was the speaker at a Fall retreat at St. Ignatius Antiochian Orthodox Church in Franklin, TN. She spoke on prayer and life in the monastery. The 4th talk is about peace: being in a right relationship with God, myself, others and all of creation. Repentance: Our reponse to Christ's invitation to live in His presence. Understanding appetites, impulses, passions. How does sin take root in us? Mother Magdalena talks about 3 forms of prayer: 1. Communal/Liturgical prayer. 2. Personal prayer time. 3. Continual prayer. Understanding the concept of relationship. What is prayer? Why do we need God? What's the place of the church, the body of Christ? Why does God need us? Why do we want God (different from needing Him)? What's the difference between heaven and hell? In her first talk, Mother Magdalena talks about the purpose of monasticism, the everyday life of a monastic, and the process of becoming a monastic.